1869 (1875 Re-issue), 1¢ buff, full o.g., rich deep color, Very Fine and choice; with 1983 P.F. certificate. 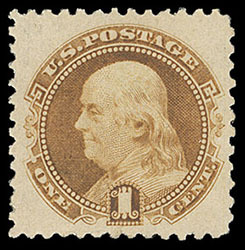 1869 (1880 Re-issue), 1¢ buff, o.g., lightly hinged, nice centering and margins, rich bold color, Very Fine to Extremely Fine; with 2002 P.F. (for block) and 2008 P.F. 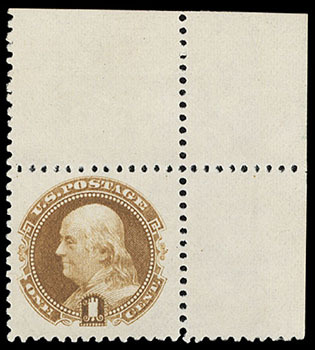 certificates, the latter Graded (VF-XF 85, SSV $475). 1869 (1881-82 Re-issue), 1¢ brown orange, corner margin single, without gum as issued, uncommonly wide margins, deep color, Very Fine, choice so large; with 1988 P.F. certificate.